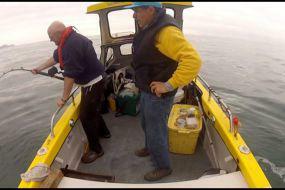 Wayne Comben and Graeme Pullen were fishing from their 17ft boat off the coast of Boscastle, Cornwall, when something grabbed a hold of Pullen's line. When the pair looked over the side to see what they'd caught, they found themselves staring into the “lifeless eyes, black eyes, like a doll's eyes...” of an enormous Porbeagle Shark. 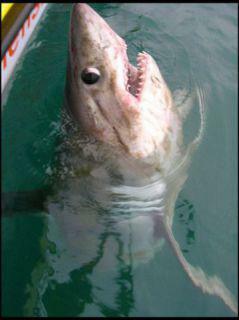 The Porbeagle is a member of the Great White family of sharks but have a reputation for being shy, secretive, and non-threatening. Tell that to Comben and Pullen, who received the shock of their lives when the shark's massive, toothy head reared out of the water right next to their suddenly too-small boat. 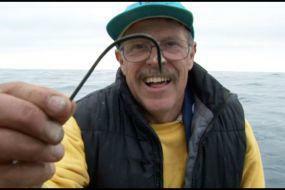 Hooking the monster shark was one thing, reeling it in close enough to be tagged was quite another. Pullen related that after giving them the once-over, the apparently annoyed shark took the two on a modern-day version of the whalers' Nantucket Sleighride. About 90 minutes later and around a mile away from their original position, the shark finally tired enough to be pulled alongside the boat and tagged. Though the previous record for a shark caught in British waters is 507 pounds or 230 kg., the portly Porbeagle won't be registered as a record-breaker because Comben and Pullen chose not to land it – and by doing so, kill it. In order to encourage the preservation of rare species like the Porbeagle shark, the British Record Fish Committee recently launched a “Notable Fish List” which recognizes such altruistic catch & releases though it stops short of declaring them as record-breakers.